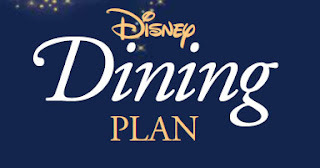 The 2011 version of the Dining Dining Plan is again a great option to consider for your Walt Disney World Resort Vacation. The Disney Dining Plan actually includes several different pre-paid dining options to fit different budgets and dining preferences. Here are the 3 most popular options: Disney Quick Service Dining Plan, Disney Dining Plan, and Disney Deluxe Dining Plan along with a brief description and 2011 prices. For more detailed information about the various Disney Dining Plan options visit the Only WDWorld - Disney Dining Plan Fact Page. The original Disney Dining Plan stays the same as it was during 2010. The original also remains the most popular by allowing you to enjoy a wide variety of Quick Service and Table Service experiences. Many Character Dining experiences are also available as choices. You should strongly consider making reservations (up to 180 days) prior to your Disney World Vacation to guarantee Restaurant availability. Disney World has been typically raising the meal prices at the Buffet Restaurants during the peak season in years past, and they are now making it part of their pricing for the Disney Dining Plan as well. No Changes in entitlements from 2010. If you really want to pamper yourself, then this is the way to go. You can eat 3 Table service meals a day in a wide variety of Disney World Restaurants. If fine dining is the favorite part of your vacations, then you may want to consider this option. In addition to price increases there are two changes impacting the 3 most popular Dining Plans: Disney Quick Service Plan, Disney Dining Plan, and the Disney Deluxe Dining Plan. Starting on March 1st it will require two Table Service Dining Credits to dine at Le Cellier for Dinner. It will remain only one Table Service credit for Lunch. Note: Gratuities are not included in any of the plans. 0 comments to "2011 Disney Dining Plan Prices"